Chichen Itza, with its famous pyramids and temples, is the Yucatan's most visited ancient Mayan site, set in the jungle and said to have been inhabited for more than 2,000 years. 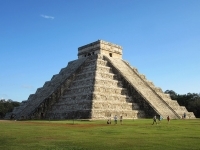 The main attraction at Chichen Itza is the Pyramid of Kukulkan (the plumed serpent god), or El Castillo, a grand pyramid topped by a temple that dominates the site and has been declared one of the 7 New Wonders of the World. Inside the pyramid is a smaller pyramid, the inner sanctum, containing one of the greatest finds on the site, the brilliant red jaguar throne with jade spots, inlaid eyes and real jaguar teeth. Another building of interest is El Caracol (The Giant Conch Snail), an observatory with slits in the dome aligned with certain astronomical appearances at specific dates. Visitors should bring drinking water, sunscreen and comfortable walking shoes. Opening times: Daily 8am to 4.30pm. Light and sound show begins 7pm (autumn and winter) and 8pm (spring and summer). Admission: MXN 98, including show. Translation headphones are MXN 25 each.